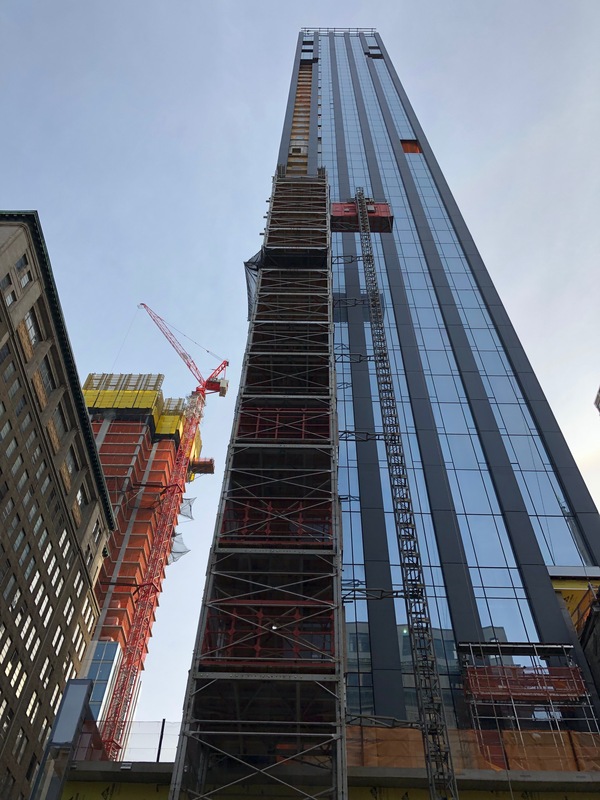 With the elevator coming down from 277 Fifth Avenue‘s western frontage over the past several weeks, the final form of the building’s exterior, comprised of dark panels, vertical window strips, and open-air terraces, is almost fully visible. 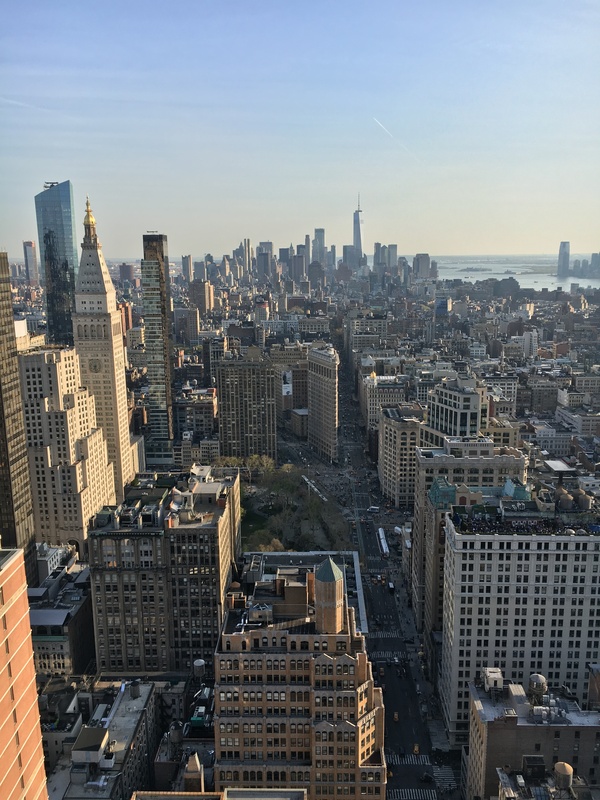 Designed by Rafael Vinoly, developed by Victor Group and Lendlease, and marketed by Corcoran, the 55-story residential tower stands 663 feet atop NoMad, and is one of the tallest skyscrapers in the area. The defining feature of the building is the multitude of integrated outdoor terraces that look out in all directions. 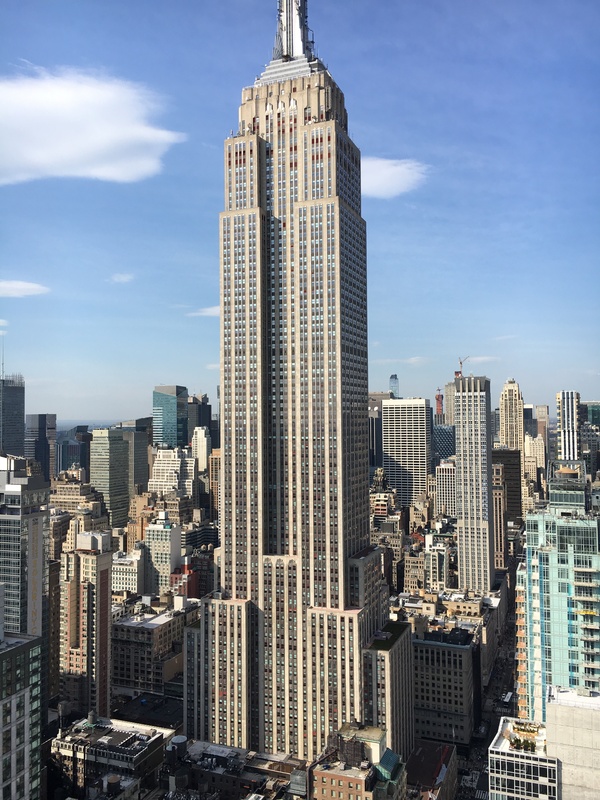 The view of the Empire State Building to the north is probably the biggest wow factor for the 130 condominiums within. Uninterrupted views of Lower Manhattan and Madison Square Park are also a noteworthy sight, looking south. Prices begin around $2 million dollars, and residences start on the eleventh floor of the building. Looking at the overall context of the neighborhood, NoMad is seeing a number of residential and hotel projects in the works nearby, including the Virgin Hotel at 1225 Broadway, 15 East 30th Street by Handel Architects, 30 East 31st Street by Morris Adjmi, the Ritz Carlton at 1185 Broadway and 30 East 29th Street developed by the Rockefeller Group. 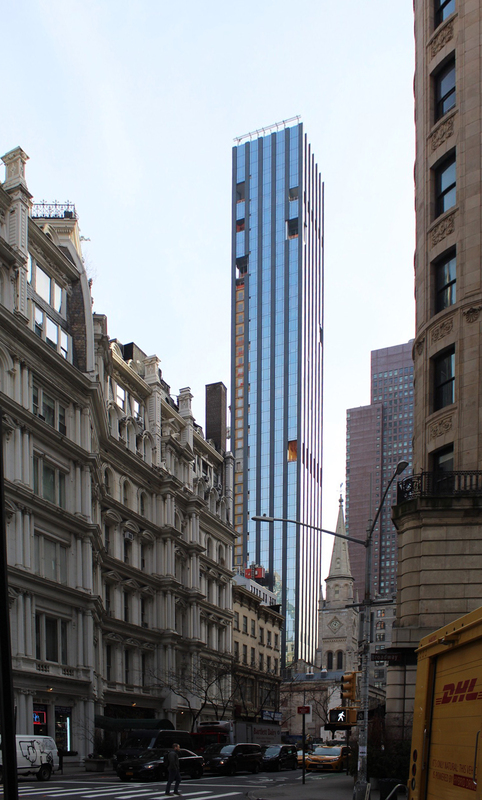 The Ritz Carlton is also being designed by Rafael Vinoly. 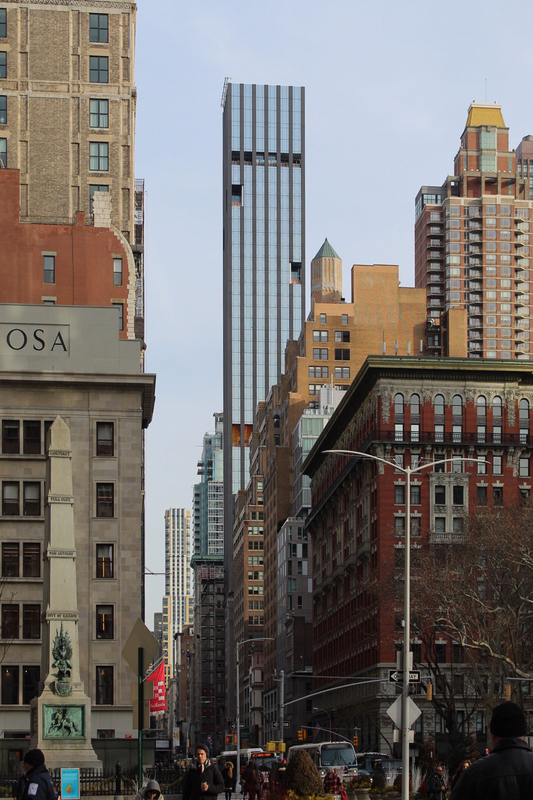 These skyscrapers will extend the skyline of Midtown further south of the Empire State Building, connecting to the cluster immediately surrounding Madison Square Park. Aesthetically, the new skyscrapers will be more spread out from each other compared to the compact nature of the blocks past the Empire State Building, but their height will also be more impressive than most extant structures south of the 40s and east of Hudson Yards. 277 Fifth Avenue will be fully completed later this summer. 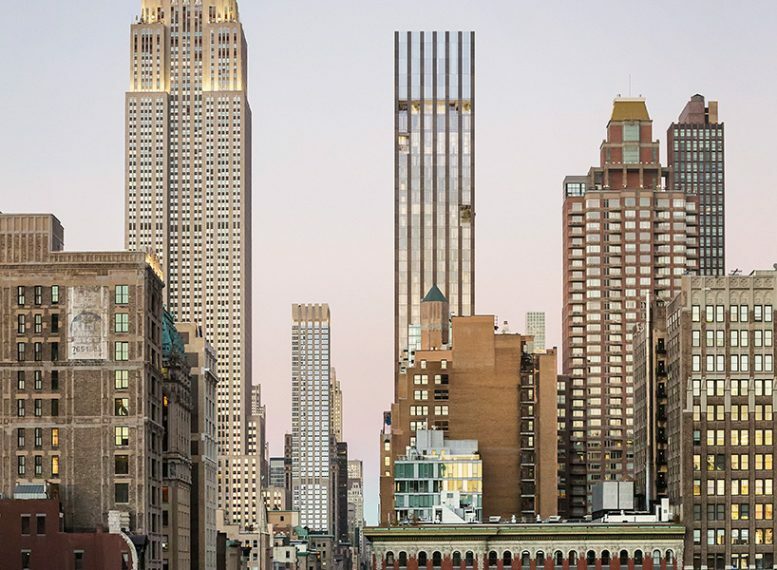 5 Comments on "Rafael Vinoly’s 277 Fifth Avenue Nearing Finish Line in NoMad"
What an odd building. From a distance, it looks completely indistinguishable. But up close, it has great appeal. Usually it’s just the opposite for towers. Once again great photos from Michael Young.Nice shot of centering the Iconic Flatiron. Bldg.Keep up the good work! Talk about giving the finger to the Empire State Building. It reminds me of all those tombstones from the 1960’s behind Rockefeller Center. Only it looks cheaper and flimsier, but just as graceless and poorly proportioned. I thought Vinoly was a good architect. My mistake.